For hospitals, clinics, and cubicle workspace, nothing works better for shutting out the world and getting your work done than our privacy cubicle curtains. These panels are sturdy and durable: they come with a triple thick 1.5 inch header reinforced with a middle layer of nylon mesh, Safe-T-Stitching in hems and seams, two-piece, rustproof, nickel-plated brass grommets; they are flame retardant, machine washable, shall we go on? These panels are compatible with all of our curtain tracks and drapery hardware. 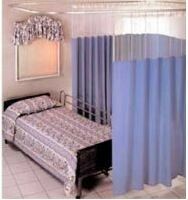 The best thing about our privacy cubicle curtains is that they can be custom-made for your exact needs. We offer multiple fabrics, colors, and sizes, and we are happy to help you custom design your new virtual wall. In most cases, we will be ready to ship it to you within two weeks of your order, which isn’t too long to wait to get exactly what you want. Patience is a virtue, and good things come to those who wait and all that - unless of course you need some privacy now. We understand that life happens and emergencies arise – grand openings, surprise inspections, temporary clinics, or you just need to get away from your co-workers – STAT. We are prepared to help: we offer a “quick ship” option for our privacy cubicle curtains. We stock 84 and 96 inch lengths (108 inch width) of the same, high quality panels we offer our custom customers that are available to ship almost immediately. In many cases we can deliver them the next day. The two colors available, sandstone and oatmeal, are neutral colors that will blend with almost any décor or environment. These panels come with a layer of mesh to meet fire code requirements. Whether you want to take your time with the perfect custom order, or you need your curtains yesterday, we want to help. Give us a call at 888-434-7444 and we’ll be happy to assist you.